Plato man ( Greek: Πλάτων, Plátōn, "wide, broad-shouldered") (c. 427–c. 347 BC), whose real name is believed to have been Aristocles, was an immensely influential ancient Greek philosopher, a student of Socrates, writer of philosophical dialogues, and founder of the Academy in Athens where Aristotle studied. Plato lectured extensively at the Academy, and wrote on many philosophical issues, dealing especially in politics, ethics, metaphysics, and epistemology. The most important writings of Plato are his dialogues, although some letters have come down to us under his name. It is believed that all of Plato's authentic dialogues survive. However, some dialogues ascribed to Plato by the Greeks are now considered by the consensus of scholars to be either suspect (e.g., First Alcibiades, Clitophon) or probably spurious (such as Demodocus, or the Second Alcibiades). The letters are all considered to probably be spurious, with the possible exception of the Seventh Letter. Socrates is often a character in Plato's dialogues. How much of the content and argument of any given dialogue is Socrates' point of view, and how much of it is Plato's, is heavily disputed, since Socrates himself did not write anything; this is often referred to as the " Socratic problem". Another dimension of the problem is the degree to which the Socrates story is fictional. Plato's portrait of Socrates is thought by many to be at odds with Aristophanes' portrait of him as a buffon in his prize-winning play, "The Clouds." Plato was born in Athens in May or December in 428 or 427 BC (like all the other early western philosophers, his birthdate is not exactly known). He was raised in a moderately well-to-do aristocratic family. His father was named Ariston, and his mother Perictione. His family claimed descent from the ancient Athenian kings, and he was related – though there is disagreement as to exactly how – to the prominent politician Critias. According to a late Hellenistic account by Diogenes Laertius, Plato's given name was Aristocles, whereas his wrestling coach, Ariston of Argos, dubbed him "Platon", meaning "broad" on account of his robust figure. Diogenes mentions alternative accounts that Plato derived his name from the breadth (platutês) of his eloquence, or else because he was very wide (platus) across the forehead. According to Dicaearchus, Plato wrestled at the Isthmian games. Such was his learning and ability that the ancient Greeks declared him to be the son of Apollo and told how, in his infancy, bees had settled on his lips, as prophecy of the honeyed words which were to flow from them. Plato hints that he was part of the Socratic entourage but never says so explicitly. He says that he was present at the trial of Socrates, but avers that he was too sick to come to the prison when Socrates was scheduled to take the hemlock. It is notable that Plato never presents himself as a participant in any of the dialogs, and with the exception of the Apology, does not claim to have heard any other the dialogs firsthand. One dialog, the Theaetetus, he denies having written. The character Euclides says that he compiled the conversation from notes that he took based on what Socrates told him of his conversation. It is not unusual for Plato to take some pains to distance himself personally from the dialogs. Plato is commonly thought to have been deeply affected by Athens' treatment of Socrates, and his so-called early dialogs have the superficial appearance of historical record. The trial of Socrates seems to be a fiasco, not to say judicial mystery: Socrates is charged with atheism, which was not clearly a crime at all in free-speech Athens; and Socrates exonerates himself, in part, by claiming to be sent to them by Apollo, an important figure in the standard Greek pantheon. Plato seems to have traveled extensively in Italy, Sicily, Egypt, and Cyrene in a quest for knowledge. Said to have returned to Athens at the age of forty, Plato founded one of the earliest known organized schools in Western civilization on a plot of land in the Grove of Academe. The Academy was "a large enclosure of ground which was once the property of a citizen at Athens named Academus... some, however, say that it received its name from an ancient hero" (Robinson, Arch. Graec. I i 16), and it operated until 529 AD, when it was closed by Justinian I of Byzantium, who saw it as a threat to the propagation of Christianity. Many intellectuals were schooled in the Academy, the most prominent one being Aristotle. Plato mentions many of his contemporaries by name in the dialogs. Political and literary figures, past and present, abound. Plato refers to Homer in many dialogs, but Socrates' attitude toward him is inconsistent. Socrates compares himelf to Achilles with regard to courage in the Apology, and condems him for being emotionally overwrought and greedy in the Republic. Plato's relationship with Aristophanes is no less interesting. An older contemporary of Plato's, Socrates accuses him in the Apology of being responsible for the slander that led to his death. 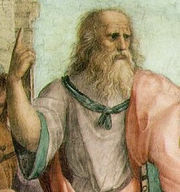 Plato is thought to be influenced by a number of prior philosophers, including: the Pythagoreans, whose notions of numerical harmony have clear echoes in Plato's notion of the Forms; Anaxagoras, who taught Socrates and who held that the mind, or reason, pervades everything; and Parmenides, who argued for the unity of all things and may have influenced Plato's concept of the soul. Raphael's Plato in The School of Athens fresco, probably in the likeness of Leonardo da Vinci. Plato gestures to the heavens, representing his belief in The Forms. Unlike Socrates, Plato wrote down philosophical thoughts, leaving behind a considerable number of manuscripts. In Plato's writings are debates concerning the best possible form of government, featuring adherents of aristocracy, democracy, monarchy, as well as other issues. A central theme is the conflict between nature and convention, concerning the role of heredity and the environment on human intelligence and personality long before the modern " nature versus nurture" debate began in the time of Thomas Hobbes and John Locke, with its modern continuation in such controversial works as The Mismeasure of Man and The Bell Curve. Another theme in Plato's writing is the distinction between knowledge and true belief. From this, problems, ideas, and arguments arose which continue to be debated by modern philosophers. Unlike most modern writers, Plato argued that the main difference between knowledge and true belief was the nature of their objects: knowledge was of eternal truths (later, the Forms), while true belief was of ephemeral, contingent truths. Plato also had a position on the art of writing as opposed to oral communication. This is evidenced in his dialogue Phaedrus and his Seventh Epistle. He said that oral communication is superior to the written word, especially in the accuracy of the oral word over the written word and in his Seventh Epistle that nothing of importance should be written down but transmitted orally. Plato wrote mainly in the form known as dialogue. In certain dialogues, postulated by some scholars as being earlier than others, several characters discuss a topic by asking questions of one another. Socrates figures prominently, and a lively, more disorganised form of elenchos/ dialectic is present; these are called the Socratic Dialogues. Some scholars believe that the nature of the dialogues changed a great deal over the course of Plato's life. According to this theory, works believed to date from earlier in Plato's life are more closely based on Socrates' thought, whereas later writing increasingly breaks away from the views of his former teacher. This theory holds that in so-called middle dialogues, Socrates becomes a mouthpiece for Plato's own philosophy, and the question-and-answer style is more pro forma: the main figure represents Plato and the minor characters have little to say except "yes", "of course" and "very true", or "by Zeus, yes". The dialogues designated by this theory as late read more like treatises, and Socrates is often absent or quiet. 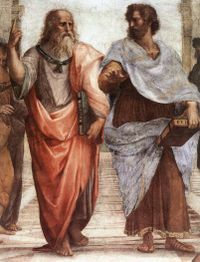 It is assumed by believers of this theory that while some of the early dialogues could be based on Socrates' actual conversations, the later dialogues were written entirely by Plato. The question of which, if any, of the dialogues are truly Socratic is known as the Socratic problem. The ostensible mise en scène of a dialogue distances both Plato and a given reader from the philosophy being discussed; one can choose between at least two options of perception: either to participate in the dialogues, in the ideas being discussed, or choose to see the content as expressive of the personalities contained within the work. The dialogue format allows Plato to put unpopular opinions in the mouth of unsympathetic characters, such as Thrasymachus in The Republic. On one level, it also gives readers an opportunity to observe and compare the conversations that different youths and men have with Socrates. Detail of The School of Athens by Raffaello Sanzio, 1509, showing Plato (pointing upwards, as if to the Form of the Good) and Aristotle (holding his hand palm down to Earth, favouring material evidence). Platonism has traditionally been interpreted as a form of metaphysical dualism , sometimes referred to as Platonic realism, and is regarded as one of the earlier representatives of metaphysical objective idealism. According to this reading, Plato's metaphysics divides the world into two distinct aspects: the intelligible world of "forms", and the perceptual world we see around us. The perceptual world consists of imperfect copies of the intelligible forms or ideas. These forms are unchangeable and perfect, and are only comprehensible by the use of the intellect or understanding, that is, a capacity of the mind that does not include sense-perception or imagination. This division can also be found in Zoroastrian philosophy, in which the dichotomy is referenced as the Minu (intelligence) and Giti (perceptual) worlds. The Zoroastrian ideal city, Shahrivar, also exhibits certain similarities with Plato's Republic. The existence and direction of influence here is uncertain; while Zoroaster lived well before Plato, few of the earliest writings of Zoroastrianism survive unaltered. In the Republic Books VI and VII, Plato uses a number of metaphors to explain his metaphysical views: the metaphor of the sun, the well-known allegory of the cave, and most explicitly, the divided line. Taken together, these metaphors convey a complex, and, in places,difficult theory: there is something called The Form of the Good (often interpreted as Plato's god), which is the ultimate object of knowledge and which, as it were, sheds light on all the other forms (i.e., universals: abstract kinds and attributes), and from which all other forms "emanate". The Form of the Good does this in somewhat the same way as the sun sheds light on, or makes visible and "generates" things, in the perceptual world. In the perceptual world, the particular objects we see around us bear only a dim resemblance to the more ultimately real forms of Plato's intelligible world; it is as if we are seeing shadows of cut-out shapes on the walls of a cave, which are mere representations of the reality outside the cave, illuminated by the sun. Plato's metaphysics, and particularly its dualism between the intelligible and the perceptual, would inspire later Neoplatonist thinkers, such as Plotinus and Gnostics, and many other metaphysical realists. 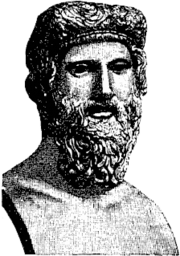 Although Platonist philosophers like Plotinus rejected Gnosticism (see Plotinus' Enneads). One reason being the Gnostic vilification of nature and Plato's demiurge from Timaeus. Plato also influenced Saint Justin Martyr. For more on Platonic realism in general, see Platonic realism and the Forms. Although this interpretation of Plato's writings (particularly the Republic) has enjoyed immense popularity throughout the long history of Western philosophy, it is also possible to interpret his suggestions more conservatively, favoring a more epistemological than metaphysical reading of such famous metaphors as the Cave and the Divided Line. There are obvious parallels between the Cave allegory and the life of Plato's teacher Socrates (who was killed in his attempt to "open the eyes" of the Athenians). This example reveals the dramatic complexity that often lies under the surface of Plato's writing (remember that in the Republic, it is Socrates who relates the story). Plato stated that knowledge is essentially justified true belief, an influential belief which informed future developments in epistemology. In the Theaetetus Plato argued that belief is to be distinguished from knowledge on account of justification. In the Many years later, Edmund Gettier famously demonstrated the problems of the justified true belief account of knowledge.In the Sophist and the Statesman Plato associates knowledge with the knowledge of the kinds and the Forms as well as of their ability of blending, which he calls expertise in Dialectic. Plato's philosophical views had many societal implications, especially on the idea of an ideal state or government. There is some discrepancy between his early and later views. Some of the most famous doctrines are contained in the Republic during his middle period, as well as in "The Laws" and "The Statesman". However, because Plato wrote dialogues, it is assumed that Socrates is often speaking for Plato. This assumption may not be true in all cases. Protective (Warriors or Auxiliaries) — those who are adventurous, strong and brave; in the armed forces. These correspond to the "spirit" part of the soul. Governing (Rulers or Guardians) — those who are intelligent, rational, self-controlled, in love with wisdom, well suited to make decisions for the community. These correspond to the "reason" part of the soul and are very few. However, it must be taken into account that the ideal city outlined in the Republic is qualified by Socrates as the ideal luxurious city, examined to determine how it is that injustice and justice grow in a city (Republic 372e). According to Socrates, the "true" and "healthy" city is instead the one first outlined in book II of the Republic, 369c-372d, containing farmers, craftsmen, merchants, and wage-earners, but lacking the guardian class of philosopher-kings as well as delicacies such as "perfumed oils, incense, prostitutes, and pastries", in addition to paintings, gold, ivory, couches, a multitude of occupations such as poets and hunters, and war. According to Socrates a state, which is made up of different kinds of souls, will overall decline from an aristocracy to a timocracy, then to an oligarchy, then to a democracy, and finally to tyranny. Perhaps Plato is trying to warn us of the various kinds of immoderate souls that can rule over a state, and what kind of wise souls are best to advise and give counsel to the rulers that are often lovers of power, money, fame, and popularity. "The safest general characterisation of the European philosophical tradition is that it consists of a series of footnotes to Plato." ( Alfred North Whitehead, Process and Reality, 1929). The Medieval scholastic philosophers did not have access to the works of Plato, nor the knowledge of Greek needed to read them. Plato's original writings were essentially lost to Western civilization until they were brought from Constantinople in the century before its fall, by George Gemistos Plethon. Medieval scholars knew of Plato only through translations into Latin from the translations into Arabic by Persian and Arab scholars. These scholars not only translated the texts of the ancients, but expanded them by writing extensive commentaries and interpretations on Plato's and Aristotle's works (see Al-Farabi, Avicenna, Averroes).